It’s Saturday. The clinics are done, the development project is finished, and we got our the final debriefing. In four days, we saw nearly 400 patients, young and old, and gave twice as many prescriptions and treatments. Among the many striking events that coloured our week, I was particularily taken aback by the character of the people. Despite the poverty, the health problems and the harsh living conditions, bright, genuine smiles were never scarce. More than just exchanging smiles and saying “Buenos días“, I was especially pleased to be able to converse with many in my broken Spanish. I discovered that making an effort and showing a willingness to communicate in the people’s native language quickly won you encouragement and support. My first real conversation occured on Wednesday, with an elderly lady from Ventanilla. I was assigned to the education tent, and since the day was drawing to a close and few patients were still being admitted, I had ample time to sit down and chat with the remaining patients between lessons. That day, we talked about where I was from, what I studied, and how the weather was. The topics of conversation may not have been groundbreaking, but the event felt immense to me. This woman and I had oceans between us (both figuratively and literally), yet she could understand me, and I, her! In the subsequent day, this newfound confidence allowed me to have even more substatial conversations, comparing the Canadian and Peruvian healthcare and education systems with the OB/GYN doctor, and finding common ground with Mary Lara, the nurse in charge of educating the villagers on hygiene, disease prevention, and treatment. With kids, there was barely any need for words. We conversed in the universal language of childhood: games and play. On Wednesday, I found a great friend in a small boy living in Ventanilla, simply by chasing around a blown-up surgical glove with him. Yesterday, I got help from a seven year old Pamplona native as I stayed behind to finish painting a MEDLIFE sign: I held the brush, and she held the pot of paint. 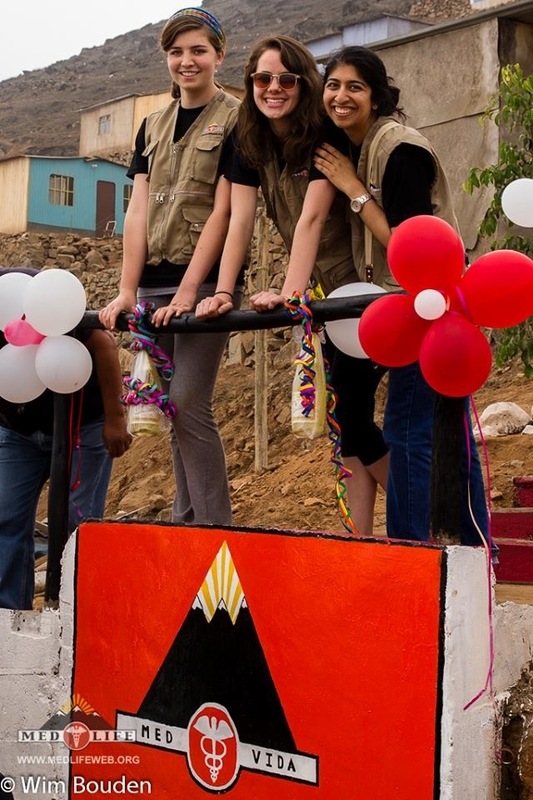 However, as we inaugurated the staircase we helped build in Pamplona Alta, I realized that language is a barrier only if you accept it as so – even with adults. We did not need to say a word to appreciate the artistry of the dancers who performed traditional dances honouring both earth and nature, nor did we need to understand Spanish to share the “pure joy”, as our intern Christina put it, that flooded us as we were invited to dance and laugh and dance some more. Moving to the sound of guitars and trumpets, we became a blur of pale and copper-colored skins, of long braided hairs and baseball caps, and of traditional colorful skirts and MEDLIFE t-shirts. Giorgio, the leader of our clinic, said we should be proud of ourselves for what we did this week. I sure am. However, even if this trip will end soon, I will continue the adventure with a renewed energy. MEDLIFE advocates for sustainability in medicine, health and education: our work for these communities, both on site and from home is therefore not done yet, it is only beginning.